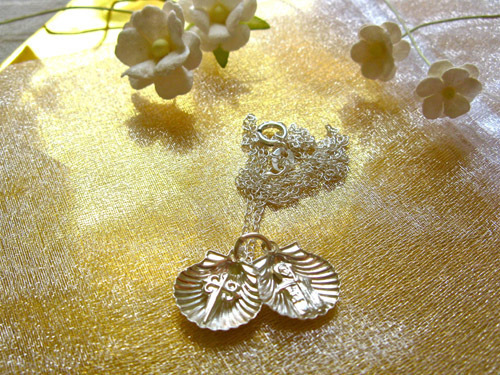 These lovely little sterling-silver scallop shells / conchas de vieira, are symbolic of the Camino de Santiago. Wish your friends or loved-ones well by sending them this really special little gift. It would show them just how much you care. Dimensions: This fine sterling silver double shell measures 14mm long x 13mm wide, or 18mm total length including the hanging ring, and is presented on an 18ins sterling silver trace chain. (20ins option also available - Please choose in options box). The inside of one of the shells features the cross of St James / cruz de Santiago; And the other features St James the Apostle / apóstol Santiago. Gift this precious little Santiago double scallop shell necklace to inspire your friends and loved ones. Comes gift-wrapped, like all our presents - and we can print a personal message on your behalf.